"A 13 Year Journey: Miles and Minds Covered"
13  An important milestone! 2014 marks the 13th year of existence of the Friends of Tibet Library, started with a humble beginning of just two books on Tibet from a personal collection. The books, 'The Tibetan Book of the Living and Dying' by Sogyal Rinpoche and 'Seven Years in Tibet' by Henriech Harrer has now given way to a much treasured collection of thousands of books on Tibet  history, art, culture, autobiographies, poems and also rare audio-visuals collected over the years. His Holiness the XIV Dalai Lama has donated books which make the Friends of Tibet collection one of the rarest and most sought after collection, treasured. 2014 also marks the 10th year of operations of Design & People, a network of creative professionals working towards social and humanitarian projects serving the needs of non-profit organisations and people's movements in India. Design & People was formed with the slogan 'Design for People in Need'  to intervene, to make a contribution to the ongoing efforts to improve the lives of people disadvantaged by war, disability, and political and environmental conditions. 38th Wellbeing Medical Camp had the august presence of Shri Jaspal Singh, IPS. Shri Jaspal Singh as the then Commissioner of Police, Baroda, Gujarat, in 1982 controlled riots with a firm hand. Later in the 1990s when he was the Gujarat State Minister for Civil Supplies, he ordered raids on the edible oil godowns of the National Dairy Development Board (NDDB), a raid which seized edible oils worth INR 80 Crores. Shri Jaspal Singh also has a very long association with Tibet and its people. His association with the Tibetans spans over 57 years and he is one of the Founders of the Indo-Tibet Border Police Force (ITBP). 2014 also marks the beginning of an Art Revolution. 'Center for Social and Political Art (CSPA)' starts its journey this year as a collaborative venture of Design & People and Sylviander Museum, Alappuzha, Kerala, India. Centre for Social & Political Art (CSPA) acts as a platform for research, documentation and implementation of Social & Political art-design projects. The institution aims at creating a forum to develop new thinking and developing constructive and collaborative programmes through its network of creative professionals from across the globe. The institution is scheduled to start its activities from November 2014. The nature-friendly Campus of Centre for Social & Political Art (CSPA) is built in harmony with environment. Ban on Plastic usage and Made in China products usage, the campus is open for individuals, organisations and institutions to conduct their events and activities related to art/photography and other creative art forms. Exhibitions, lectures, discussions, workshops, conferences for small groups, film screenings and joint events with CSPA. After a journey covering many miles and many minds, the Friends of Tibet exhaustive collection of books will soon find the final resting place at CSPA Campus. With a humble beginning with two books from a personal collection of Shri Sethu Das, Founder, Friends of Tibet, the journey began 13 years back. The journey has enriched hundreds of researchers, human rights activists, filmmakers and supporters of the Tibetan Cause. Rakhee Sandilya, a documentary film-maker from UK/Mumbai in one of her mails said "I would begin with my documentary film which is based on the diasporic Tibetan community and I needed an intense research as I want to highlight the Tibetan issues in the present scenario; the world is concerned about Egypt, Syria, Palestine but seem to have forgotten about Tibet. I came to know a lot of information about the issues from the books and films which I borrowed from the Library. It made me realise how I can develop my own film which could not only stand out but also give a fresh insight into the issue. Thanks to the library of Friends of Tibet and people associated with it." Treasured by many, the collection includes books personally donated by His Holiness the XIV Dalai Lama. One of the places where the library functioned from needs special mention  Swatantra Party Office in Fort, Mumbai, where Indian Leaders like Shri C Rajagopalachari, Shri Minoo Masani and many other national leaders met and discussed issues of National Importance, was also a place for spreading knowledge on Tibetan Culture. The Friends of Tibet Library functioned for a brief time from this very office premises in Fort Mumbai. Other places include Regency Inn, Colaba, South Mumbai. The Friends of Tibet Library was later functioning from the residences of the Friends of Tibet Founder Shri Sethu Das and National Co-ordinator, Shri CA Kallianpur. "Without libraries what have we? We have no past and no future  Ray Bradbury. This will be my one liner describing our Friends of Tibet library. It is an ever open door which will guide us through the maze of knowledge. It is even more true in the case with Tibetan knowledge as many of the books which we have to refer are not at all available in India. Many of the ones available are only from anti China countries which are rather biased. But the Friends of Tibet Library with its all features are known for having an unbiased collection of all the knowledge on the soul issue of Tibet. Personally it has been a 'leading kindly light' as Cardinal Newman might put as it was the soul repository which gave me texts for my research both as primary and secondary. It has provided me with umpteen strength that I was able to make my thesis as one of the pioneering works in Tibetan literature and English literature. Thank you FoT library from the bottom of my heart. I wish all success for the library and its development as CSPA." "We found exactly what we were looking for and at the time we needed it. When that happens, belief in hope is re-instilled." August 9, 2014 marks the beginning, to reach more researchers, political and social designers and activists. 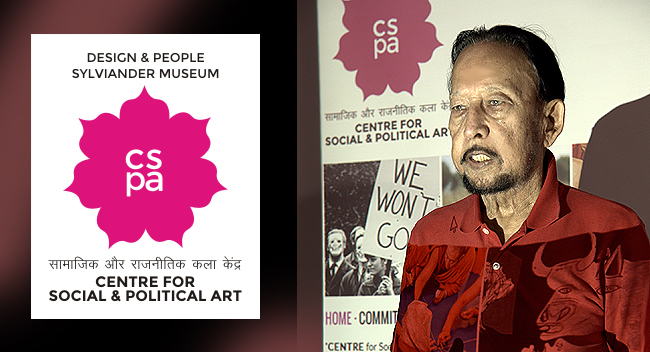 The Centre for Social and Political Art (CSPA) website  www.cspa.in was officially opened to the general public by Shri Jaspal Singh, IPS. This also marked the launch of the Friends of Tibet Library, a repository of Books and Audio-Visuals on the subject. "My Association with Tibet is 57 years old, a good number of years spent with the Indo Tibetan Border Police Force since its formative years. I am happy to be part of this event and keep up the good work," says Jaspal Singh.